(Born Dec. 20, 1847 ; died July 2, 1903). Another earnest, worker has passed from the vineyard of Christ to the reward and rest of eternal life, one who by family connection linked us with the remoter past of Primitive Methodism. Those links one by one are being severed, and the Connexional life is taking to itself new methods of development and adjustment in regard to the newer and larger needs. Madame Vaslet, youngest daughter of the late Rev. 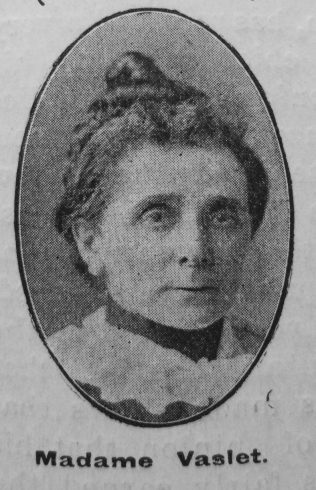 Thomas Russell, was born at St. Austell during her father’s appointment there. Her earlier education, through the then frequent changes of locality and other causes, was subject to serious checks. It was nevertheless liberal and thorough, and was finished at a private school in St. Albans, in 1868. She became an ardent and devoted worker, especially in the Sunday School and Band of Hope. Mr. Russell was appointed to Dover in 1872, and immediately began the work of evangelism and extension, for which his life was so noteworthy. The clamant needs of Dover, where our cause in Peter Street was then but feeble, aroused him, and he almost immediately opened a new mission in the pier district, which resulted in the erection of a chapel. His daughter and devoted wife, as indefatigable as himself, joined in the holy crusade. Miss Russell at once commenced a Sunday school and Band of Hope, which were continued until the chapel was sold for railway extension. A new mission was also commenced at Haxton, Dover, by the Russell family. Here again Miss Russell began a Sunday school and Band of Hope, in a room built by her father, in 1874. This work has resulted in untold good to the district, and it is now enlarging and full of gracious promises and almost unlimited extension. Charlotte was born on 20 December 1845, not 1847 as stated in the obituary, at St Austell, Cornwall, to parents Thomas Russell and Elizabeth Ann Duke. Before her marriage Charlotte was a schoolmistress. She married Emile Joseph Vaslet (abt1851-1924) in late 1881 at Dover, Kent. Emile was born in Belgium and worked as a professor of languages. Census returns identify two children.